Micromax Bharat 1 Online Buy, Price, Features, Launch date in India: BSNL launched the Micromax Bharat 1 4G Feature phone for this Diwali. The BSNL’s Micromax Bharat 1 mobile is priced at Rs 2,200. The mobile is going to release on 20th October and will be accessible to buy from the same date. BSNL has introducing the 4G services for the first time in India. The BSNL is the trusted mobile network in India. BSNL is planning to introduce the Micromax 4G phone for the people who are not still using the Smartphones. The Micromax Bharat 1 mobile phone will be launched with 4G feature that is accessible with internet. Facebook, whatsapp, and YouTube apps can be used on BSNL 4G Feature phone. Also, the Bharat Interface for Money (BHIM) App will be pre-loaded with this gadget. The BSNL 4G Feature phone is a ‘worth for value’ feature phone. Check the BSNL Micromax Bharat 1 4G Feature phone specifications and features, data/ recharge plans from here below. “We are proud that we are partnering with Micromax, a home-grown player which has been a key player in India’s growth journey and has contributed more than 150 million mobile users and this number is ever increasing,” said Anupam Srivastava, CMD, BSNL. “Connecting the last mile– to the Internet and relevant information – is an important part of the strategy for both BSNL and Micromax. We are confident that Bharat 1 will help millions of users experience the data and calling experience like never before,” added Srivastava. Recently the competitor networks Reliance Jio and Bharti Airtel launched the 4G Feature phones. The 4G Feature phones have got huge reputation from the people. Now, the most-trusted mobile network BSNL has launched the Micromax 4G feature phone with the best features and affordable monthly recharge plan of Rs 97. BSNL Offers the free voice calls and 4G Internet services with a simple recharge of Rs 97. BSNL Micromax 4G Feature phone was launched with BHIM App and it also enables the users to watch TV on the phone. This mobile also having another great feature to support any of the outsider networks. That is, the users can use any other network’s SIM card such as Airtel or Vodafone on this phone. The SIM Portability is not offered on other 4G Phones like Reliance Jio. BSNL 4G Phone is the best feature phone within this range of feature phones. Also, the users can enjoy the unlimited voice calls, 4G Data benefits at just Rs 97 per month. The Micromax Mobile Bharat 1 will have the BSNL SIM bundled, but you can use it with any other service provider too. The progressed 4G feature phone has a 2.4-inch display and is fueled by a Snapdragon processor. The Dual SIM 4G gadget accompanies 512MB RAM and 4GB ROM. It is packed by a 2000mAH battery inside and even highlights two cameras; 2MP on the back and a VGA quality shooter in the front. Bharat 1 also accompanies the help for 22 unique dialects. Bharat 1 will be totally make in India. Sub milkey humko chuteya banarahay…..
Bhai ye Micromax waale khud k use k liye bnaye h kya ? 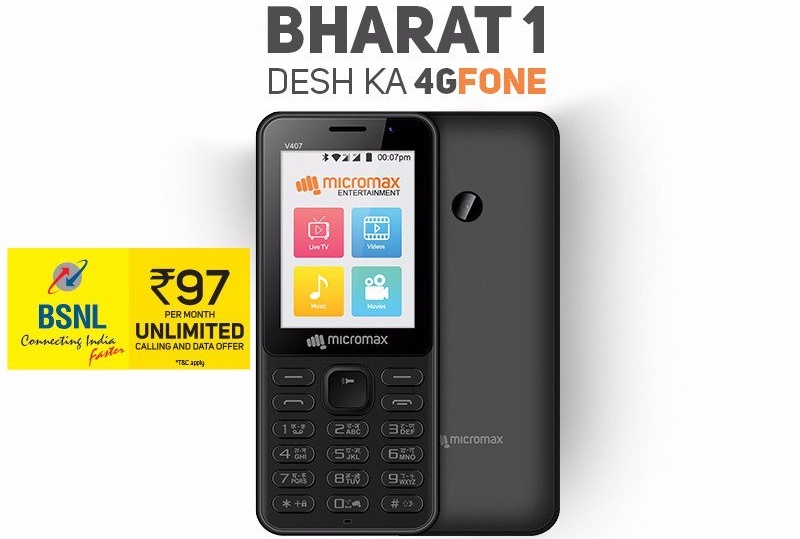 How can I buy Micromax Bharat 1 4G Feature phone online? From where i this phone micromax Bharat 1. Urgently i should this book. PLS HURRY UP, I WANTS BOOK. any one get the mobile delivered. I want to buy this phone how can I get this phone? how can I buy bharat 1 mobile phone and when?